My daughter, Miss Priss, had an American Girl Christmas. 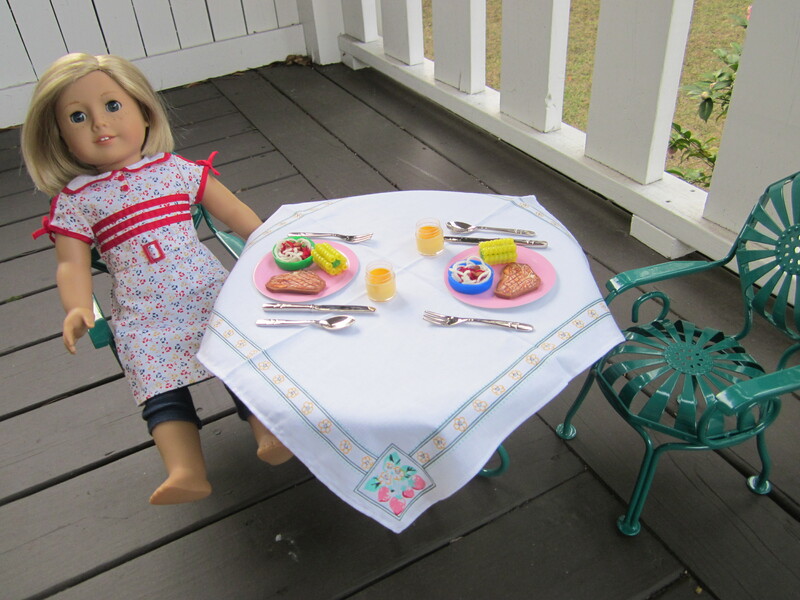 Buried at the bottom of the American Girl gift pile was a book/kit we gave her called Do-it-Yourself Doll Dining. 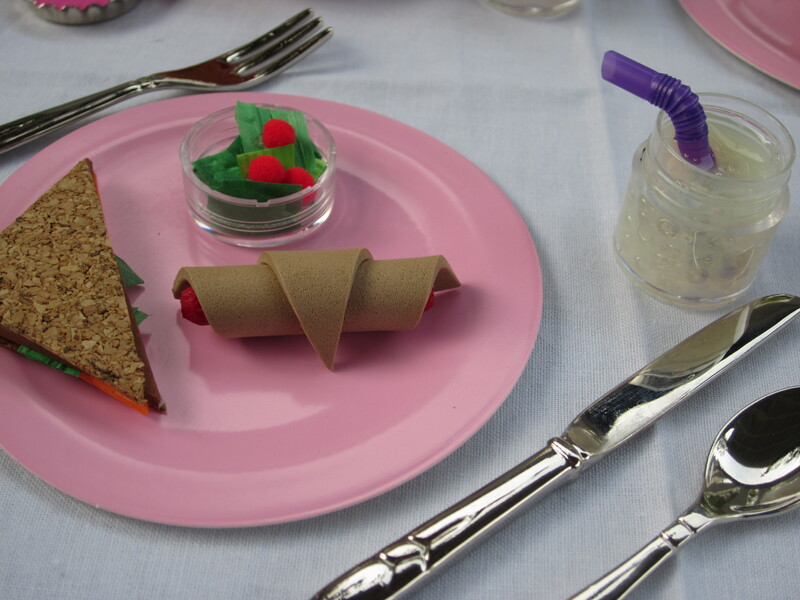 Our kit came with some paper plates, colorful papers, and a book about how to make doll food for American Girl. After one trip to Michael’s for foam sheets and glue dots to get us started, the American Girl food project quickly spiraled out of control. It has been two days since I started AG doll food production. We have been to Michael’s and Hobby Lobby twice ($85 and counting– with coupons), my kitchen table is buried in doll food materials, and Miss Priss is no longer involved in the process. If you have that crafty obsessive gene like I do, making the food is pretty fun. If you have the do-a-project-with-your-child-for-a-fun-afternoon gene, the ideas are quick and easy as long as you stick with the basic directions. Either way, you– I mean your daughter– can open an American Girl restaurant. Reservations recommended. I included a material list at the end of the post. There is a basic list that can be used to make most of the items. If you want to take it to another level, I added the carried away list. Anything in the directions marked with ** require materials from the carried away list. Cereal: With a hole puncher, punch many foam circles in tan and brown. Punch stars or hearts in pink and light green**. Punch partial holes in white to make moons. 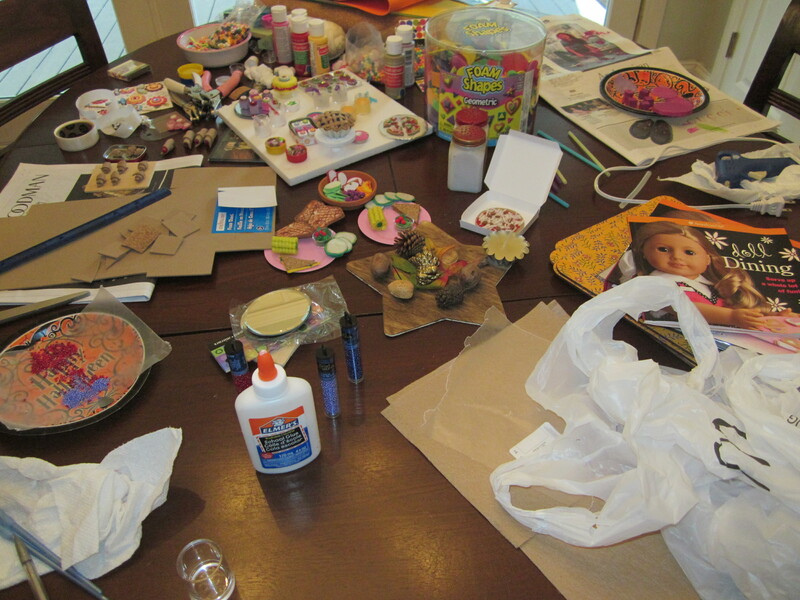 Fill plastic bottle cap from a 2-liter soda bottle 2/3 full with Elmer’s glue or white acrylic paint. Add punched pieces of foam and press down lightly. Let dry. Bacon: Using brown foam sheet, cut wavy strips into a bacon shape. Fried Egg: Using white foam sheet, cut a wavy oval to look like a fried egg white. Cut a small yellow circle from the yellow foam sheet (or use the hole puncher). Attach yellow circle to the white piece with a glue dot. Toast: Cut a 1 1/2 in. square from the corkboard. Cut in half diagonally. Cut 2 tiny yellow squares from the yellow foam. Attach yellow square to the corkboard with a glue dot. Cup of Milk: Fill a clear plastic bottle cap or plastic bead storage jar** with Elmer’s glue 3/4 full. Cut straw to a little taller than the bottle cap/jar. Put cut straw into cup while glue is wet. Let drive overnight (or longer). You could also squeeze some white acrylic paint into the bottom of a clear plastic lid or a bead jar. Tip the jar slightly and let the paint run up the sides. Roll the jar until the sides are covered. Stand jar upright and let dry overnight. Croissants: Cut tan foam in long skinny triangles. I tried a few different sizes. I liked about 3/4 inches at the base of the triangle and about 2 inches tall. Put a glue dot on the point (skinny end) of the triangle. From the wide end, roll the foam until the glue dot attaches. Use glue dots to attach finished croissant to a cardboard rectangle or wood rectangle to look like a baking sheet. Sandwiches: Follow the directions for toast above. Trace toast triangles on colored foam for sandwich fillers (yellow or orange for a cheese slice, brown for a meat slice, etc.). Take the adhesive backing off the corkboard and add one layer of sandwich filling. Use glue dots to attach other pieces. Use tiny pieces of green tissue or rafia ribbon for lettuce. To top sandwich, remove adhesive backing from the second bread triangle and attach to the top. Salad: Cut small squares of green tissue, green curly ribbon, and green rafia ribbon. Put a pile in a bottle cap or bead storage jar lid. Put a glue dot on 3 mini red pom poms, attach to leaves of lettuce. 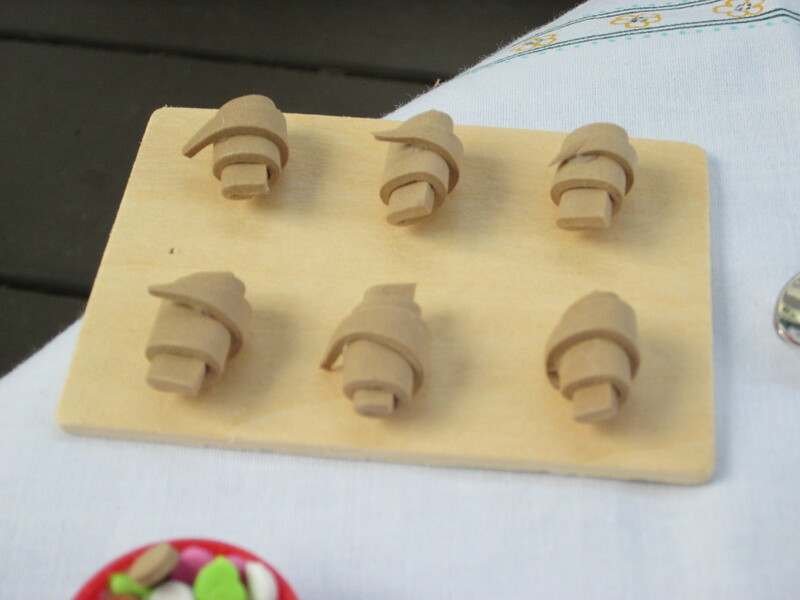 Pigs in a Blanket**: Paint wood dowels red and let dry. Follow directions for the croissants above. Cut tan foam a little wider than the croissants. When hot dogs are dry, put a glue dot on the skinny point of the triangle and wrap around the hot dog until the glue dot attaches. Ice Water**: Fill bead storage jar or clear bottle cap about 2/3 full with Diamond Glaze. Add clear beads and straw and let dry overnight. Fruit Dip: Fill a metal bottle cap with light pink acrylic paint. Put a small piece of styrofoam packing peanut on top for whipped cream. Let dry overnight or longer. 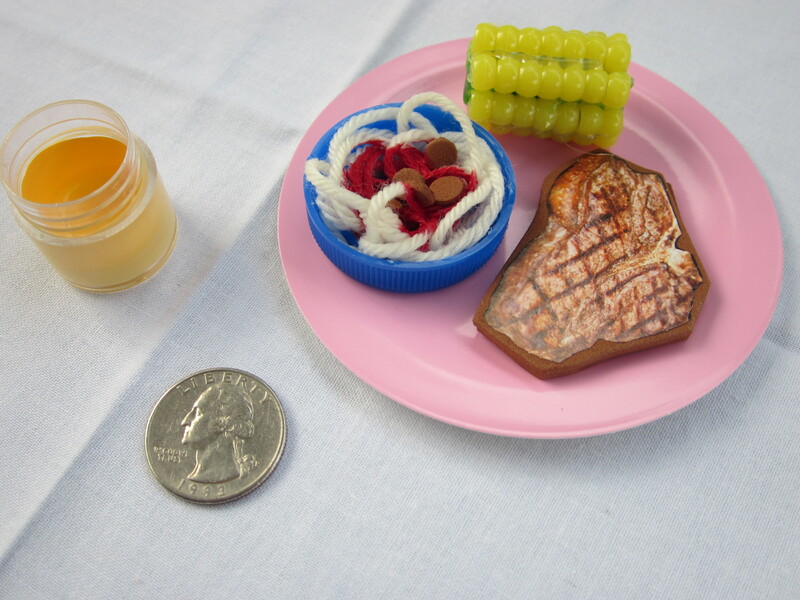 Fruit: The Doll Dining Kit came with stickers that you attach to foam sheet pieces to make the fruit slices. To make grapes, attach glue dots to mini pom poms (purple for red grapes or green for green grapes). Stick pom poms to small sticks to look like a grape bunch. Orange Juice: Squeeze some yellow paint into the bottom of a clear plastic lid or a bead jar. Tip the jar slightly and let the paint run up the sides. Roll the jar until the sides are covered. Stand jar upright and let dry overnight. Spaghetti and Meatballs: Cut a long piece of yarn and coil it into a plastic bottle cap (we used a gallon milk jug cap). Squeeze red acrylic paint on top to look like sauce. Punch out brown foam circles with hole puncher. Gently press brown dots on paint before it dries. Corn on the Cob: Cut green crayon pieces that are about 1 1/2 in. long. Knot one end of a piece of twine and thread about 7 beads (or as long as your crayon piece). Make a line of glue on the crayon and holding the beads tight on the string, press the row of beads to the crayon. Once the beads are secure, remove string and repeat around the crayon. I used a hot glue gun**, but hot glue makes crayons melt! 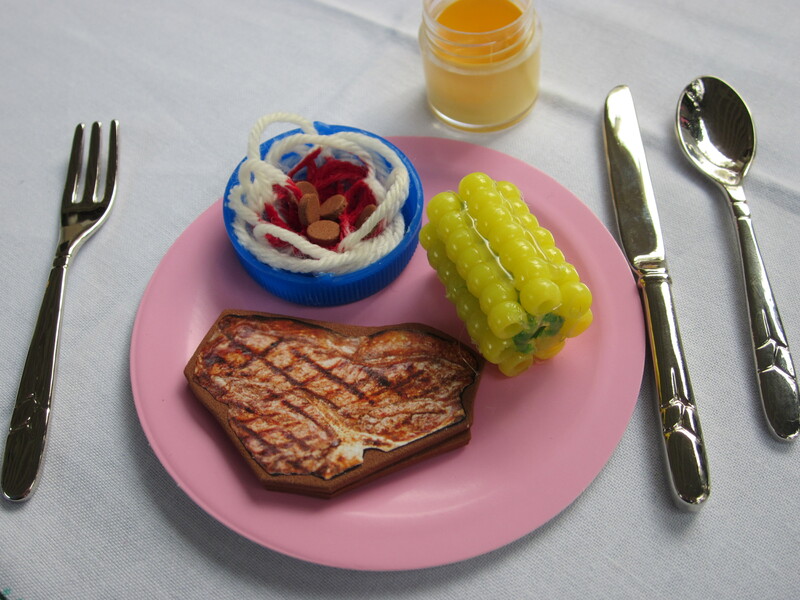 Steak: The Doll Dining Kit came with stickers that you attach to brown foam sheets to make the steaks. Pizza: Use a drinking glass or other round container to trace a circle on the tan foam sheet. Cut out the crust. Paint the crust with red acrylic paint but leave a little tan showing around the edges. While the paint is wet, sprinkle very short pieces of cream colored yarn around the pizza. Add brown foam circles cut with a hole puncher for pepperoni, small black beads for olives, tiny green pieces of rafia ribbon for green pepper, or any other topping you can create. You may need to attach toppings with glue dots. When pizza dries, cut slices with scissors. Pizza Pan: Trace a circle larger than your pizza on a piece of cardboard. Cover with tin foil. Pizza Box: Comes with the Doll Dining Kit. 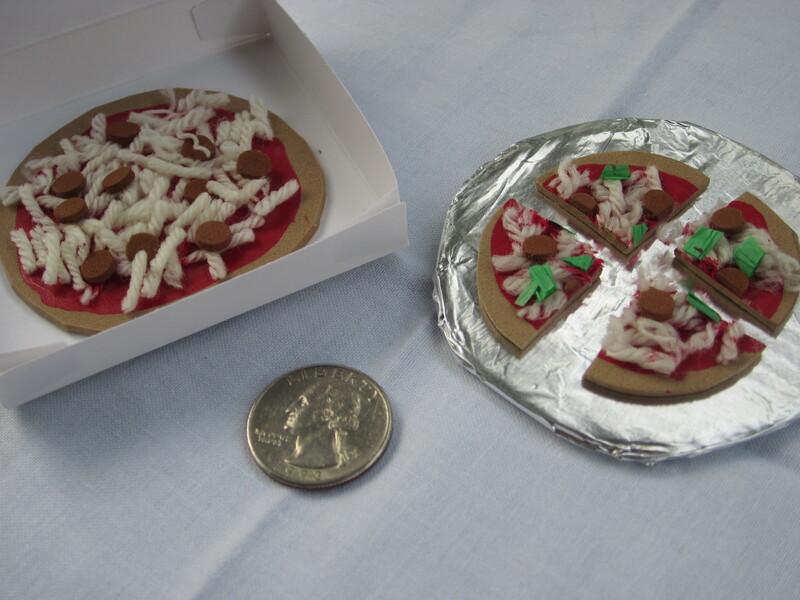 Cookies: Wrap a 2 1/2″ x 3 1/2″ cardboard rectangle or wood rectangle in tin foil. Using glue dots, stick 12 small pink foam hearts to foil wrapped tray. Using a heart shaped hole punch, make 12 tiny brown hearts**. With glue dots, stick the brown hearts to the center of the pink hearts. Instead of foam shapes, you could use 12 matching 3-D scrapbook stickers** in heart or flower shapes to the tray. 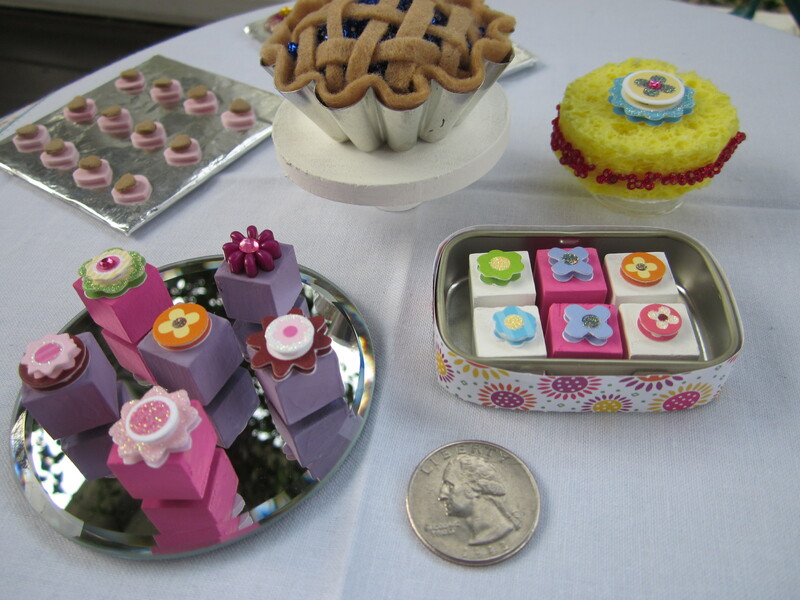 Petits Fours**: Paint 1/2″ wood cubes with acrylic paint and let dry. We did 4 each of white, pink, and purple. After the blocks dry, attach 3-D stickers of your choice to the top. Detach the lid from a mini Altoid tin and wrap the base of the tin with a strip of scrap paper to hold some of the little cakes. Sponge Cake: Trace a circle on a new yellow kitchen sponge. Cut the circle out of the sponge. Draw a line of glue around the middle of the side of the sponge. Hold sponge over a plate and sprinkle red seed beads** on the glue to look like a line of berry filling. You could also draw a red line with a Sharpie marker. 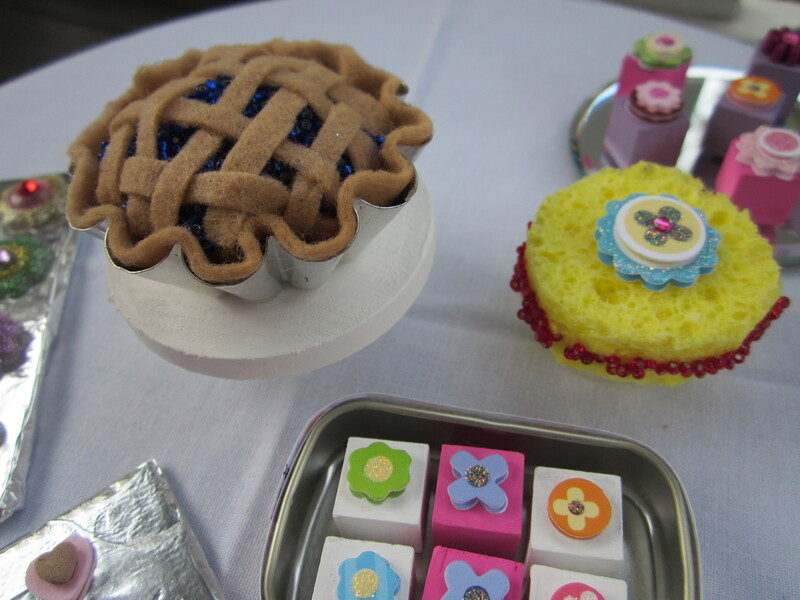 Top sponge cake with a 3-D flower sticker**. 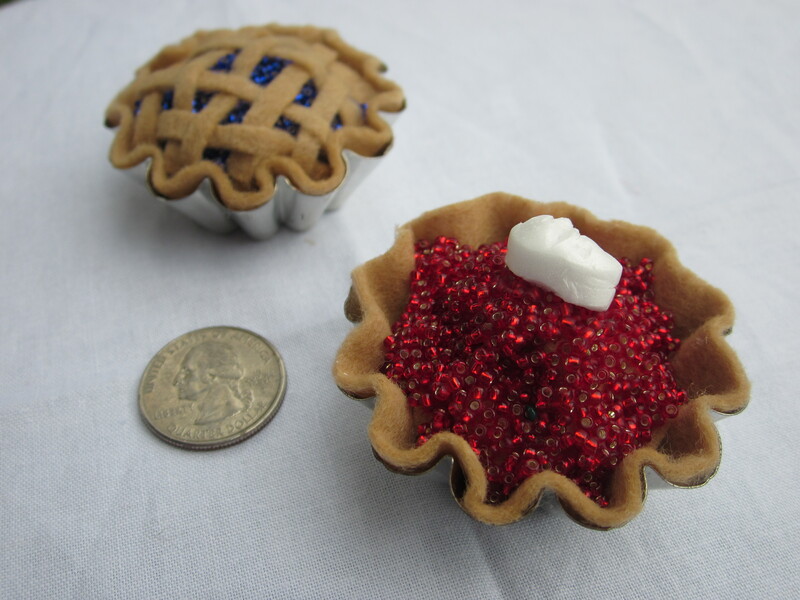 Blueberry Pie**: Put glue dots around the bottom and sides of a mini tart tin. Press a piece of tan felt into the bottom. Cut the edges, so the felt matches the edges of the tin. Put a blob of glue on the felt at the bottom of the tin. Fill with a wad of tan felt. Dribble glue over the felt and sprinkle with blue seed beads. Add more glue and beads as needed. Cut very thin strips of felt and weave together. I used 5 strips x 4 strips. Lift woven felt strips onto the top of the pie. Trim strip edges and tuck into the sides of the tin. Let dry. 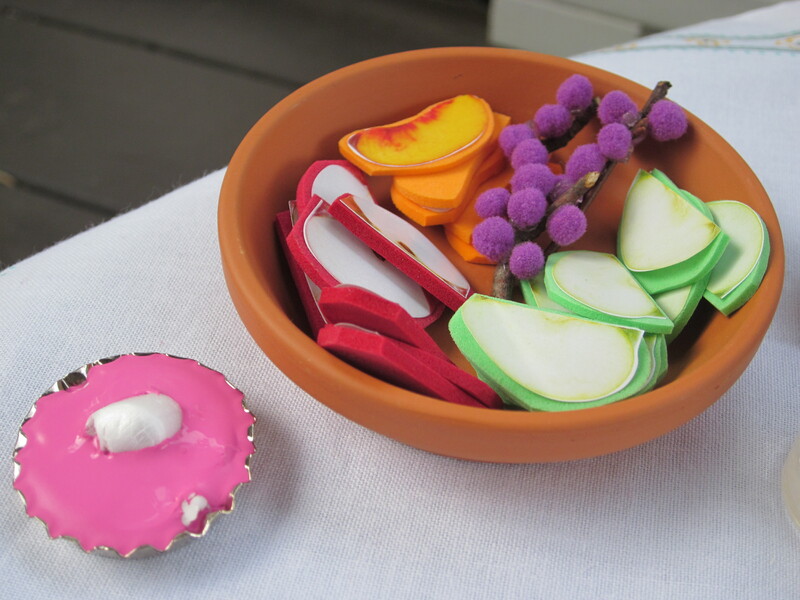 Cake Plate**: Paint a wood disc and mini wood spool white (or any color you prefer). You may want 2+ coats of paint. When paint dries, hot glue wood spool to the bottom center of the wood circle. Hobby Lobby had a great wood piece aisle with all shapes and sizes of wood blocks, spools, flat rectangles and discs, and dowels. They also had mini mirrors in the candle making section, mini baskets in the basket aisle, mini clear acrylic boxes with lids in the craft section, and the seed beads and plastic beads. Michael’s had the 3-D stickers, foam sheets, glue dots, and the bead storage jars. Hobby Lobby had most of these items too. The madness continues. Check out the American Girl Sweet Shop and American Girl School Supplies. I’m going to show this to my youngest daughter. She’s 11 – the age when some days doll are too babyish and other days she’ll play with them for hours. I think she’d definitely get into this. It’s definitely something an 11-year old could do. My daughter (6-yr) made all of the sandwiches and salad, and they turn out so well! Very satisfying. You should see my medicine cabinets and pantry. I raided everything I could for a variety of bottle caps. I am 10 and I did all the stuff without wood. Have you talked with the DollDiaries person? She’s nice. I don’t know the DollDiaries person. I will look her up. I took my daughter to the American Girl store in NYC this week. We had so much fun! We are inspired to work on new crafts this week while we are on spring break from school. Check back soon for more ideas. Ooh– didn’t think about coffee straws. Some of the proportions are off. Even the book has items that the scale doesn’t seem quite right. It doesn’t really matter; it is all cute! This is awesome! You crack me up- do you have extra hours in each day? Or do you just stay up all night and make doll food? The puppy is killing any productivity I had going before Christmas! When project brain is turned on, I don’t sleep very much. I seriously spent 3 solid days during Christmas vacation making doll food. Hope puppy training is going well! I simply LOVE your doll food ideas and how to’s!!! This is the best wordpress post I’ve seen. I especially love the sandwich and pie. I hope to borrow your inspiration soon with my daughter as well. Thanks So much for posting these. Thank you for reading! The blueberry pie is my favorite too. We made these this weekend. We tried several of your ideas and added a few of our own. I’ll send you pics. Great ideas! 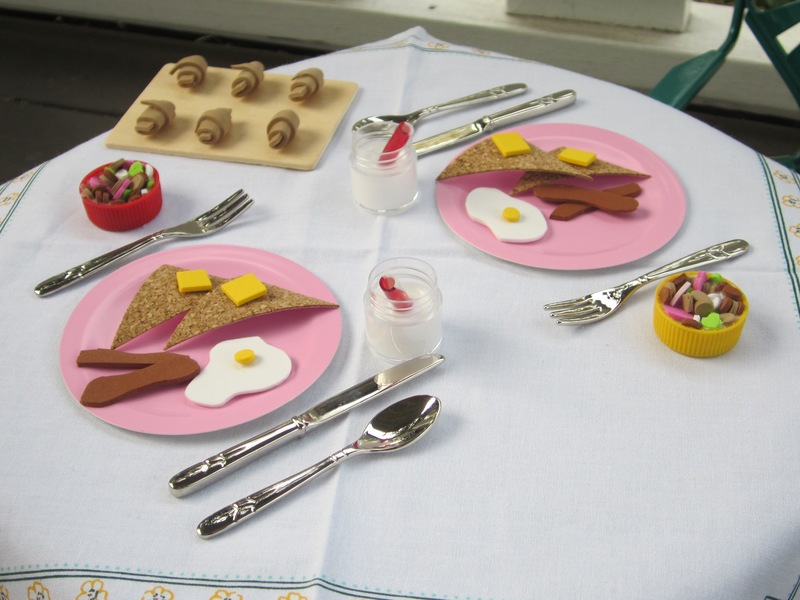 I have made my own food for my daughters dolls, but I am always thrown off by the scale of the items. The scale is 1:3 and every time I make something I measure according to the scale, but the items are too small for the doll based on the scale. I think I’m being a little obsessive. Do you consider the scale/size of the items when you make them ? I don’t really pay attention to the scale. 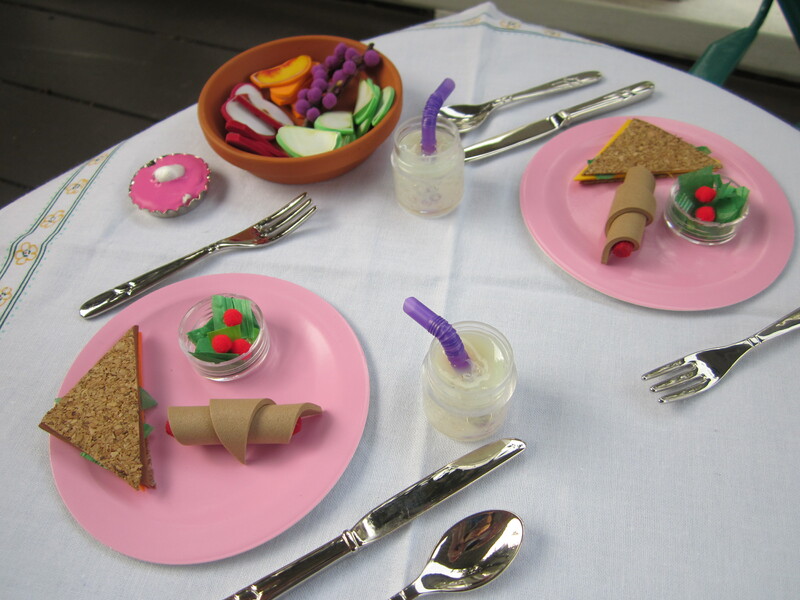 Some of the items I made according to the AG Doll Dining books are close. I can tell if they are way too small (like the 3-ring binder directions I found and modified to be bigger– that’s in the AG Goes Back to School post). If you look at the Sweet Shop post, my milkshake cups are too small, but they are so cute, I don’t mind. The wedding cakes in the sweet shop post are off too, but again, they are so cute, I don’t really mind. Thanks for reading! I am sooooo excited to try this! Where did you buy the mini tart pans for the pies? Your projects are so cute and inspiring! I love the blueberry pie! I love those pies too! I found the tart tins in the home section at TJ Maxx. You can find them on Amazon if you search “mini tart tins” or “tartlet tins.” Here is one link http://www.amazon.com/Norpro-Tartlet-Tins-Set-36/dp/B000SSVA80/ref=sr_1_1?ie=UTF8&qid=1442515437&sr=8-1&keywords=mini+tart+tins. Thanks for leaving a comment! Amazing, I get carried away too extremes also, my husband escorted our granddaughter to a daddy and me dance. They had a silent auction for 2 American Girl dolls he called and said what should I do. I told him not to walk out of there without one of those dolls luckily there were only two people bidding on them. They each walked away with one that was my daughter granddaughters 8th American Girl doll between Christmas and her birthday in February and she’s only 9. She has a American girl doll house, custom made closets, massive 18 inch doll clothes. I know I went massively over board. We live in the country, only neighborhood children are boys. I’m disabled and cannot do physical activities so this is perfect for her and I to do together. Thank you for making this easy-to-use post. I love doing these crafts with my daughter. Totally time well spent. I’m glad you and your granddaughter are working on this together. So fun!